114 Men Hair & Body Wash provides your entire body with a quick & easy clean. Its 2 in 1 hair & body formula, acts both as a refreshing shower gel & a moisturizing shampoo. Its generous but ultra-light foam rinses off quickly leaving your skin feeling refreshed & your hair hydrated & healthy looking. Formulated with men’s body in mind and using the highest quality ingredients, our dual action shower gel for both body and hair, stands out as one of the few shower gels with an incredibly rich foam and a long lasting fragrance. A true masculine cleansing experience inspired by a vibrant nightlife, “Night” features a woody fragrance infused with notes of amber and musk. 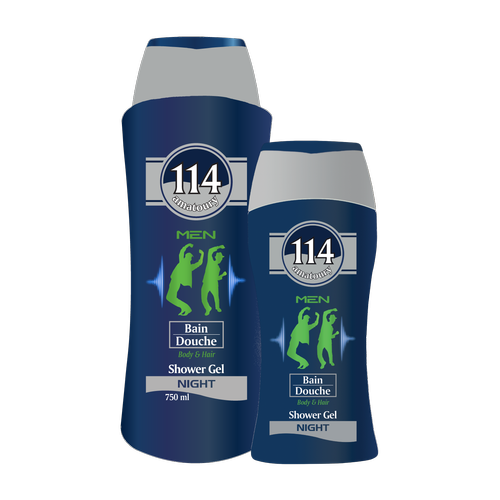 This shower gel will not only cleanse your skin as well as your hair, but it will also keep you going strong, all night long. Does not contain Parabens. Aqua, Sodium Laureth Sulfate, Lauryl Glucoside, Cocamidopropyl Betaïne, Polyquaternium-7, PEG-7 Glyceryl Cocoate, Cocamide DEA, Glycol distearate, Laureth-4, Sodium Chloride, Perfume, Citric Acid, MethylChloroisothiazolinone, Methylisothiazolinone,Tetrasodium EDTA, Benzyl Salicylate, Linalool. Formulated with men’s body in mind and using the highest quality ingredients, our dual action shower gel for both body and hair, stands out as one of the few shower gels with an incredibly rich foam and a long lasting fragrance. A true masculine cleansing cleansing experience inspired by energetic vibes, Adventure” features a spicy fragrance infused with notes of precious wood. This shower gel will not only cleanse your skin as well as your hair, but it will also keep you invigorated all day long. Does not contain Parabens. Aqua, Sodium Laureth Sulfate, Lauryl Glucoside, Cocamidopropyl Betaïne, Polyquaternium-7, PEG-7 Glyceryl Cocoate, Cocamide DEA, Glycol distearate, Laureth-4, Sodium Chloride, Perfume, Citric Acid, MethylChloroisothiazolinone, Methylisothiazolinone, Tetrasodium EDTA, Alpha-iso-methyl Ionone, Benzyl Salicylate, Butyphenyl Methylpropional, Coumarin, D-Limonen, Hydroxycitronellal, Hexyl cinammal, Linalool. Formulated with men’s body in mind and using the highest quality ingredients, our dual action shower gel for both body and hair, stands out as one of the few shower gels with an incredibly rich foam and a long lasting fragrance. A true masculine cleansing cleansing experience inspired by athletes, “Sport” features a citrusy fragrance infused with notes of sandalwood and patchouli. 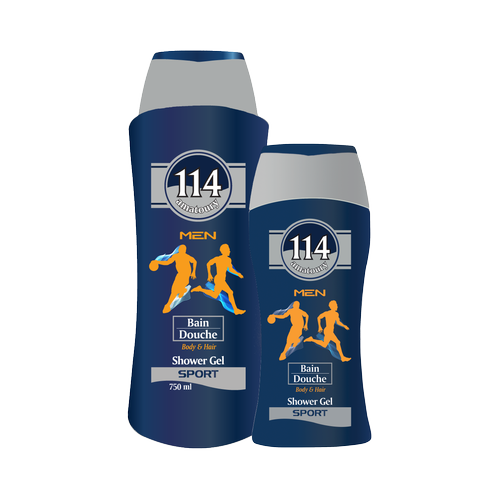 This shower gel will not only cleanse your skin as well as your hair but it will also energize you like a real athlete. Does not contain Parabens. Hexyl cinammal, Linaloolnone, Tetrasodium EDTA, Citronellol, Coumarin, D-LimoneneBisabolol, Citric Acid, Methylchloroisothiazolinone, Methylisothiazoli-Glycol, Chamomilla Recutita (Matricaria) Flower Extract, Glucose, Propylene Glycol, Butylene 7-Chloride, Perfume, Polyquaternium, Cocamide DEA, Sodium 4-Copolymer, Glycol distearate, Laureth Glyceryl Cocoate, Coco Glucoside, Styrene/Acrylates 7-Betaïne, PEGAqua, Sodium Laureth Sulfate, Cocamidopropyl.